*DROP OFF YOUR OLD MEDICATION* Another prescription drug take back will be hosted by the Bridgeville Police Department in partnership with DEA and the Bridgeville Volunteer Fire Department (BVFD). It will be held at the BVFD on April 26th, between the hours of 10:00 AM and 2:00 PM. Please contact the Bridgeville Police Department at (302)337-8302 for more information. The Bridgeville Charity Open Golf Tournament was held on October 14, 2011, at Heritage Shores. The tournament had a full field and had over 60 sponsors. At the December 5th meeting of the Bridgeville Kiwanis Club, the three beneficiaries of the tournament proceeds, the Bridgeville Kiwanis Foundation, the Bridgeville Senior Center, and the Bridgeville Lions Club, were each presented with a check in the amount of $2,650. In addition to the check presentation, the organizations and the Tournament Committee recognized the outstanding assistance provided by Jesse Savage and Peggy Smith in putting on the tournament during the past five years. Please read the 12/20/11 Public Notice from Bridgeville Police Chief Robert Longo for more information related to recent burglaries in Town. U.S. Sen. Tom Carper (D-Del) visited the Bridgeville police at Town Hall on Monday, December 12, 2011 to see the two police cars the town purchased with a grant it received from the USDA Rural Development program. From left: Sgt. Burke Parker, Sen. Carper, Police Chief Robert Longo, and USDA State Director Jack Tarburton. January 16-21, 2012, at the Delaware State Fairgrounds Please mark your calendars for Delaware Agriculture Week, January 16-21, 2012. Delaware “Ag Week” is in its 7th year and is an ongoing collaboration between University of Delaware Cooperative Extension, Delaware State University Cooperative Extension, and the Delaware Department of Agriculture. Delaware Ag Week provides useful and timely information to the agricultural community and industry through educational meetings and events. Please visit http://sites.udel.edu/delawareagweek/ for more information. 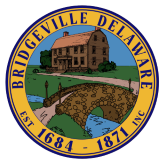 ATTENTION BRIDGEVILLE RESIDENTS: Please be advised that you will no longer be billed by the Town for garbage and recycling services. You will now be billed quarterly by Waste Management for those services. Their first bill, which has already been sent out to the Bridgeville residents, is for the months of November, December and January. Please read the letter from Waste Management for more information. You may also contact the Town Office should you have any questions. It is the duty of the Bridgeville Police Department and Chief Robert Longo to protect and assist the citizens of Bridgeville. The Police Department fulfills these duties by providing foot and vehicle patrols that help to eliminate crime and drugs. Mandatory law and equipment training program requirements keep officers up to date. These mandates help to ensure that the Town of Bridgeville has knowledgeable and dependable officers patrolling the streets.